“Despite his German birth and long residence, Petri came from Dutch stock. His father was violinist Henri Wilhelm Petri, who taught his son the instrument that teenage Egon played in the Dresden Court Orchestra (1899 - 1901) and in papa's string quartet. At age seven, however, he began piano lessons, notably with Teresa Carreño (Louis Moreau Gottschalk's Venezuelan-born protégé). On reaching 20, encouraged by his father's friend Ferruccio Busoni, Petri decided the piano was his lifetime instrument. He became Busoni's pupil and eventually his amanuensis. At Dresden, Weimar, and finally Berlin (where Petri also studied philosophy) he learned from Busoni not only the art of pianism, but an appreciation of Bach and Liszt in particular, the twin anchors in his transatlantic repertoire. In 1915, Busoni moved to Switzerland for the duration of WWI, and invited his favorite pupil to assist him in editing Bach's keyboard works. By this time, Petri had débuted in Holland, Germany, and England (and was professor of music at the Manchester Royal College of Music for six years, 1905 - 1911). In 1920, Busoni moved back to Berlin, where the Weimar Republic appointed him professor of composition at the Academy of Arts. When Petri came too, Arnold Schoenberg engaged him at the Hochschule für Musik (1921 - 1926), where his scholarship students included Victor Borge from Denmark. Canadian pianist Gunnar Johansson was another. For many years Petri also taught master classes at the Basle Conservatory. In 1921, he joined Busoni in a concert of two-piano music at London, and in 1923 became the first foreign-born solo artist to perform in the Soviet Union, so successfully that he played 31 concerts in 40 days. 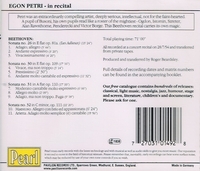 Petri took up the cause of his mentor's music, including the ‘Brobdingnagian’ Piano Concerto with chorus and orchestra. At the same time he proselytized on behalf of Liszt (already out of favor intellectually; his importance and influence were not reevaluated until after WWII), and Bach of course, in Busoni's editions and transcriptions. In 1927, Petri moved to Zakopane, Poland, where he lived until 1939. His U.S. début came when he already was 51 -- in New York on 11 January, 1932 -- followed by touring. His recording career did not begin until 1929, nor with an orchestra until the prewar London Philharmonic, conducted by Walter Goehr (in the Tchaikovsky First Concerto) and Leslie Heward (Liszt's Second and the Fantasy on Beethoven's’ Ruins of Athens’). Stateside, Petri recorded ‘Rhapsodie espagnole’ with Mitropoulos and the Minneapolis Symphony, but otherwise, only solo repertory or chamber music (Brahms' d minor Sonata in 1937 with Szigeti is legendary). Fortunately, an all-Busoni program in 1941 by Mitropoulos and the NYP was broadcast with Petri playing the’Indian Fantasy’.